Brian is a Bury St Edmunds man through and through, having been born and educated here and having worked here all his life. 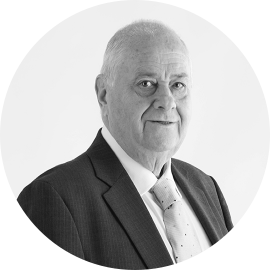 His working experience has always been in accountancy, from the accounting function through internal audit in the West Suffolk Hospital group in the 1960s then moving to join a local firm of Chartered Accountants in the early 1970s. There he dealt predominantly with accounts, VAT and payroll for sole traders, partnerships and family companies and has continued his interest in this type of work for clients of all sizes. In 1993, he went into partnership with Bob Jacobs and Robert Allen and formed one of the foundations of the current business. His experience in accounting technical matters and superb organisational skills make him very efficient at putting together accounts and dealing with tax returns, ensuring that compliance issues are kept well under control. Most particularly, he has built up specialist expertise in accounting for property management companies and attendant property investor issues. He qualified as a member of the Association of Accounting Technicians in 1987 and became a Fellow in 1994, concentrating his efforts on essential accounting matters. Outside of work, one could say that he’s a bit of a dark horse — sorry, that should be he owns a bit of a dark horse, and some others besides. He is seriously into horse racing and his co-ownership of horses has obviously been astutely managed, as his syndicate has had a number of racing successes. Whether you can get the inside knowledge to give you a better chance at the bookmakers is of course debatable.